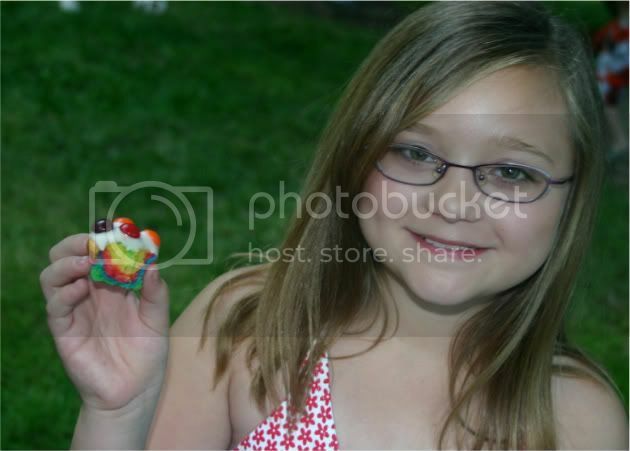 I wanted to blog about these mini colorful cupcakes, since they were one of my favorite things at Baby O's birthday. 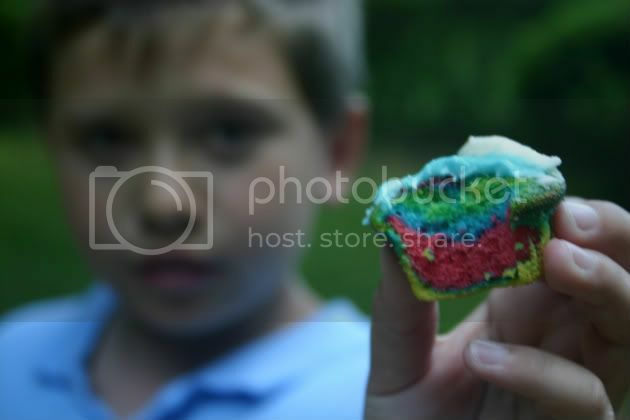 I was inspired by Omnomicon's rainbow cake, my cousin Michelle's tiny party, and my sister Kar. Step 1 - make a cake mix (I used a white and yellow cake mix because I wanted to make lots). I also used butter instead of oil, I think it tastes better. Divide into four parts. 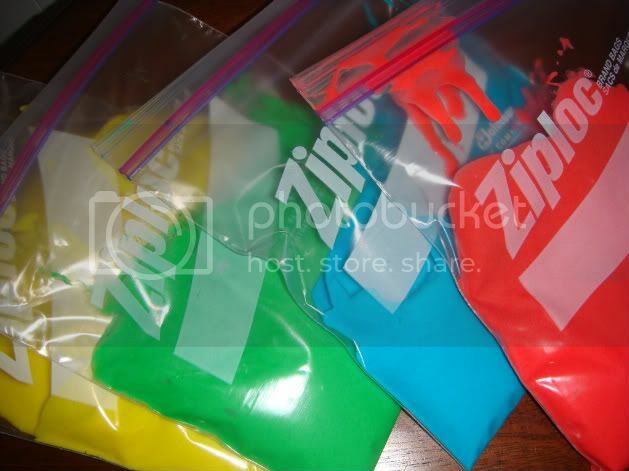 Add lots of food coloring (see pic above). Wait, this is like 3 steps all in step 1. Oh, I did red, blue, green and yellow. Step 2 - Stir in food coloring. Add more coloring if you want bolder colors. Pour into zipper bags and cut a small tip off one of the corners, so that the batter can be easily added to the mini cupcake wrappers. 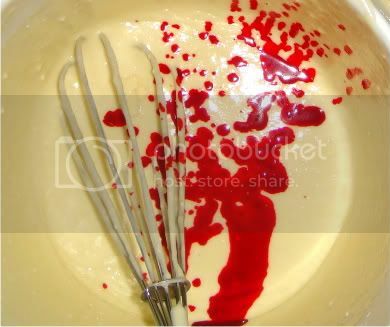 This is a lot less messy than trying to pour the batter for tiny cupcakes. Wait, that's also 3 steps. 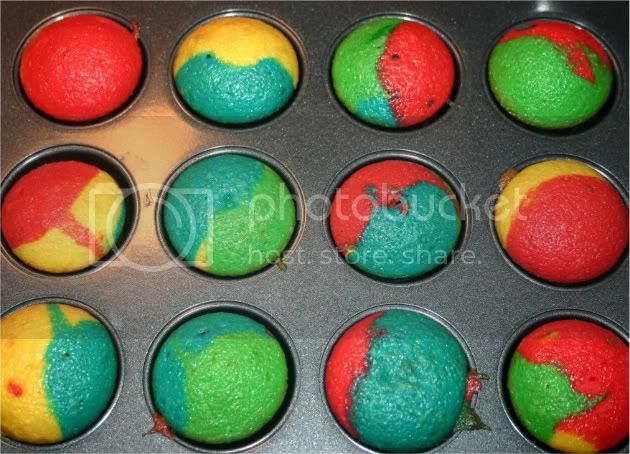 Step 3 - Squeeze 1, 2, 3 or all 4 colors into each cupcake wrapper. 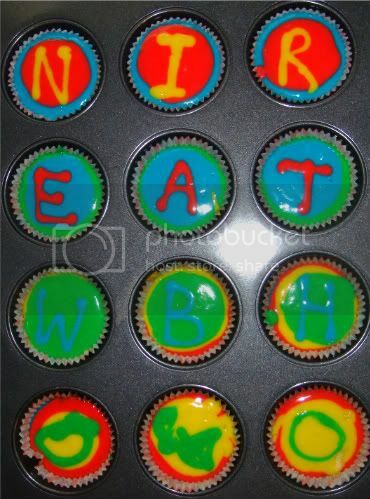 (Above, I tried writing out letters, but after they baked, it just looked like a psychedelic mess.) For the final product, the solid or 1 color cupcakes looked the best, but for biting into the cupcakes the 4 colors looked best. 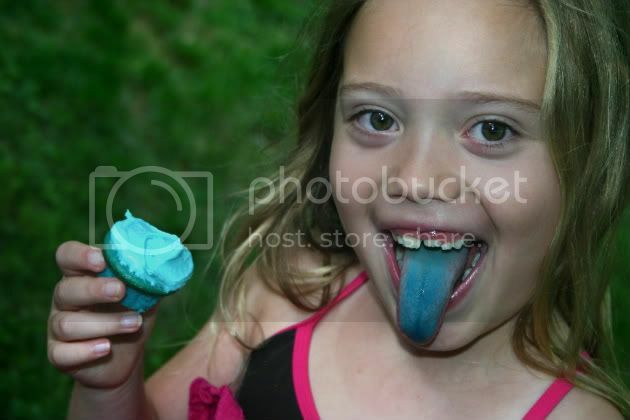 Here's what the 1-3 color cupcakes looked like (above). 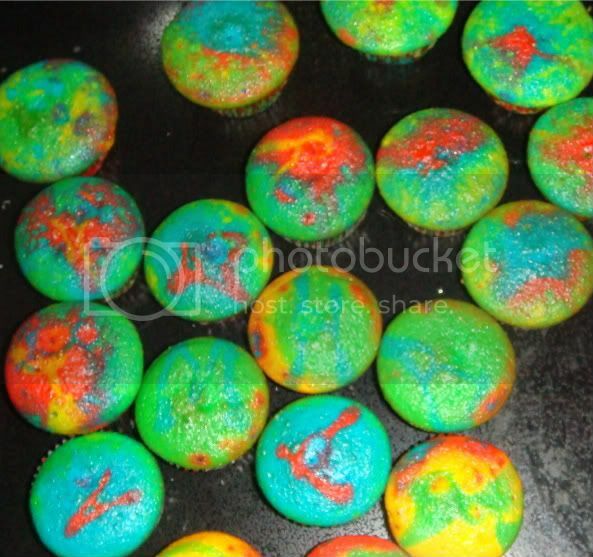 Here's what the psychedelic cupcakes looked like (above). 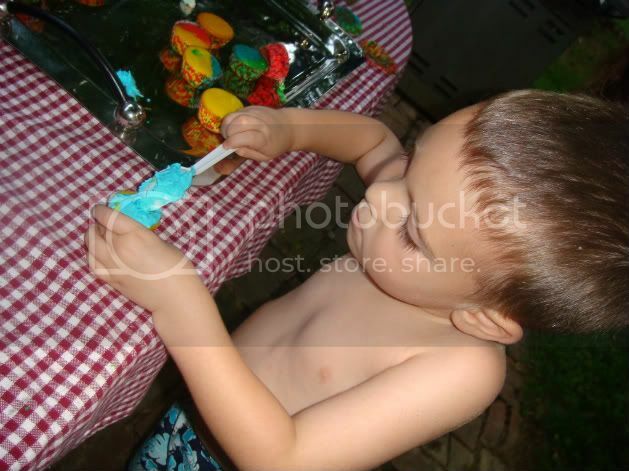 Step 4 - I made a butter cream frosting (dyed one blue and left the other one white - it was a boy birthday party). However, the mini cupcakes where too stunning to cover them with frosting before Baby O blew out his candle, so I let the kids put on their own frosting. This was actually a good idea. Because the kids could add no, little or lots of frosting. 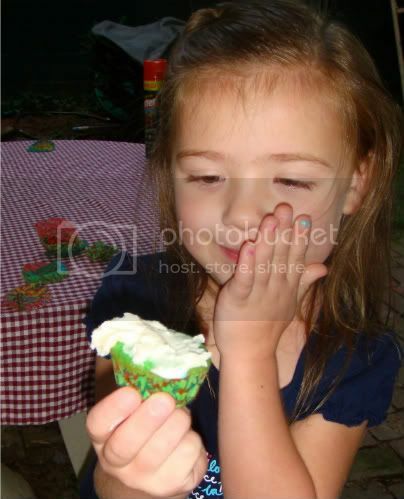 Each kid got to customize their mini cupcakes. They were bite size, so you could eat one (if you were trying to watch what you eat/don't like lots of sweets) or eat 4+ (like most of the kids). I think I'll always do mini cupcakes for birthday parties now. Total 96 mini cupcakes were devoured by the end of the party! Maybe next time I'll use 3 cake mixes.